There are countless internet quizzes that helps sort you into Hogwarts houses depending on your personality, but nothing comes quite close to this: an actual sorting hat powered by IBM Watson. 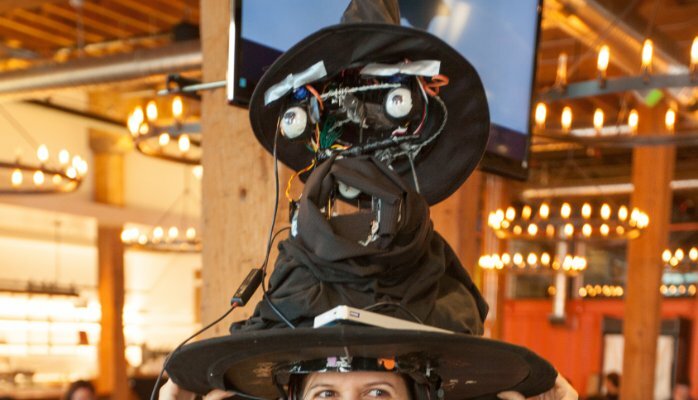 The hat, created by IBM engineer Ryan Anderson, started off as a fun project for him and his two daughters to help expose the girls to STEM while bridging it with their interests in the Harry Potter series. The hat uses Watson’s Natural Language Classifier and Speech to Text to let the wearer simply talk to the hat, then be sorted according to what he or she says. Anderson coded the hat to pick up on words that fit the characteristics of each Hogwarts house, with brainy and cleverness going right into Ravenclaw’s territory and honesty a recognized Hufflepuff attribute. His daughter helped by adding lines of established “ground truths” for each of the four houses, with Watson using deep learning to figure out more attributes and expanding known qualities of each house every time the hat is worn. Of course, Anderson also programmed the hat to actually move and speak back to the wearer, drawing data straight from the IBM Cloud. So far, he’s tested it with his daughters and a small group of friends, but he’s also tried inputting characteristics from the Wikipedia pages of famous people including Stephen Hawking, Hillary Clinton, and Donald Trump. With above 90 percent certainty, the hat sorted Hawking and Clinton into Ravenclaw for their wits. Trump was assigned to Gryffindor for his boldness – but only with a 48 percent certainty. If you’re looking for a weekend project, Anderson has provided the tutorial for you to get started with building your own, and you can use IBM’s Bluemix platform to test it out. Good luck redesigning the hat to be a little less bulky though!